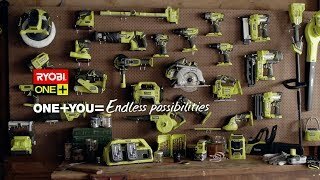 Own the ultimate DIY all-rounder with the RYOBI 18V ONE+ Multi-Tool. This handy little unit can perform more tasks than almost any other handheld tool available. The reciprocating blade can reach no-load speeds of up to 20,000rpm. So if you’re cutting through wood, metal, plastics or other common materials, you’ll have more than enough power to get the job done. The RYOBI 18V ONE+ Multi-Tool comes with everything you’ll need to deliver a quality result. To stay in control of your project, the LED work light can illuminate the tool’s immediate space. You’ll even find 3 basic accessories – with the wood blade, the wood/metal blade, and the sanding pad in each pack. Not only can you make smooth cuts to your projects, but leave it with a perfect finish. To deliver a quality cut with an equally smooth finish, trust in the RYOBI 18V ONE+ Multi-Tool. Grab your RYOBI 18V ONE+ Multi-Tool from your local Bunnings Warehouse.